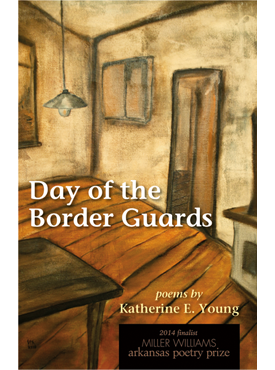 Day of the Border Guards, the debut collection from Katherine E. Young, is set entirely in Russia and the countries of the former Soviet Union. The ghosts of Russian writers Pushkin, Mandelstam, Tsvetayeva, and many others wander through these poems, making tea, fighting with their relatives, cursing faithless lovers. Bulgakov’s heroine Margarita describes meeting the Master; Lermontov’s grandmother worries that the young poet is wasting his life. Lady Macbeth is alive and well and living in post-Soviet Georgia. Enemies stalk the margins: hostile warlords, informants, the secret police. A man falls through the ice into a ruptured hot-water pipe, nuclear reactors melt down, an airplane lands on Red Square. Perestroika arrives and departs, like other fashions. A marriage falters. The phone rings in the middle of the night in a Siberian hotel. The corpse of a gypsy king boards a plane for Moscow. Young, who also translates Russian poetry and prose, has lived and worked in Russia and the Soviet Union off and on since 1981: not surprisingly, then, these poems—originally published in The Carolina Quarterly, The Iowa Review, and The Massachusetts Review, among others—willfully skip across borders of language, culture, and literary tradition, exploring Russian and North American poetic traditions and celebrating both. Katherine E. Young is an award-winning translator of Russian poetry as well as the author of two chapbooks of original poetry. “Young lived in Moscow during those last days of the Soviet empire, when the country ran on rubberbands and spit. Winters were brutal. Centralized heating was about as effective as the centralized government: when uninsulated pipes ruptured, people burned to death—and all the pipes were uninsulated. These poems are bone-chilling: looking out her window, Young sees “leafless birches // shivering the ice-covered court yard” (“Centralized Heating”). But Russia isn’t all about bad weather and feeling out of place. And Young’s poetry is anything but drab and dreary. This is also a world of vodka, tea, and hand-knotted rugs. In fact, the poems are so deeply imbued with Russianness that Young might be a Russian poet herself, very ably translated by the American poet Katherine Young! There’s such a sense of authenticity—a familiarity with the environment, the people, and the great Russian writers themselves—that the reader never feels these are travel poems.